I say “estimate” because I still have lots of buildings that I’ve cast, but haven’t cleaned up or counted yet. Keeping up with myself can be a bit tricky – I’m pouring nearly two gallons of resin per casting day. So casting continues on schedule, although I’m working on a bit of a snag regarding the corner pillars. As you saw a couple updates ago, I’m now sitting on a great big pile of stock for the corners that all needs to be cut to length. Unfortunately, none of the techniques I’ve tried for cutting the pillars quickly have been satisfactory so far. My first plan was to use a tool called The Chopper (a little guillotine-like thing for slicing through plasticard) but it wasn’t able to cut cleanly through the thickness of the tubing. Then I figured I’d go with the nuclear option, and try a bandsaw. While that works, only one side of the cut comes out cleanly – and since the top of one cut is the bottom of another piece, that won’t do. Second, I’m looking at my options with the bandsaw – a different blade or type of saw may solve the problems with the rough cuts. Third, my last resort is to trim the tubes by hand using a miter box, the same way I did for the pieces that went into the finished buildings you saw during the campaign. This will get the job done (and should still not prevent me from delivering in a timely fashion) but is something I’m hoping to avoid for obvious reasons. I may be able to bring on a gullible chump/valued helper to assist me if it comes to that. I had planned out getting my own degassing setup for after the campaign was wrapped up, but the delay (as well as finding a really good price on a vacuum chamber) caused me to alter my plans. The new vacuum chamber is already up and running, and we’ve cranked out a big pile of new molds in record time! Karl Marx was right, comrades – we have seized the means of production! So with both pressure pots online and a sufficient number of molds, I’m pleased to report that full-scale production has now begun! I’ve been working out the most efficient system for casting, and last Wednesday I managed to crank out 72 buildings in one (long) session. The damaged print I mentioned last time has been redone and is shipping now. 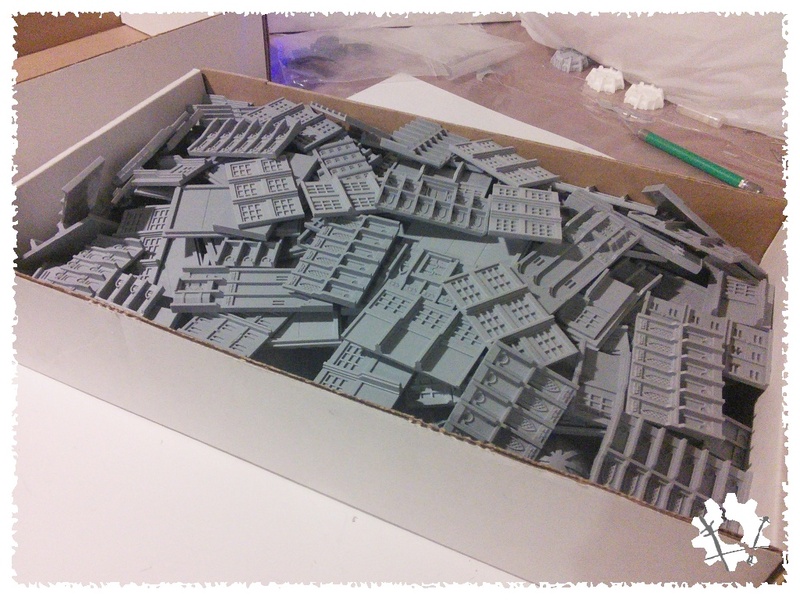 I’ve just restocked my resin supplies, so the next few weeks should be a frenzy of tiny buildings. I’ll keep you posted with my progress / spiraling resin-based madness.